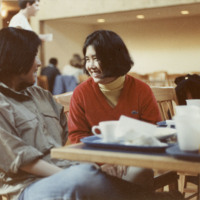 Two unidentified students sitting and talking at Erdman Dining Hall. Cups of coffee, plastic cups, trays and plates are also visible. 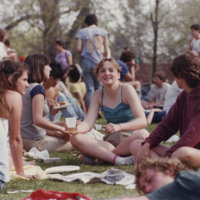 Students sitting on the lawn, one with a beverage in hand and another holding a plate of food while other empty plates are visible on the grounds along with newspapers and one student sleeping. 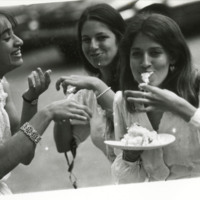 Sherry Masoudi (Class of 1985) pictured with two other unidentified students in a photo from the 1983 yearbook. The student on the right-hand side is eating while the others are laughing.